There is a commercial component pack for Firemonkey called HTML Component Library which allows you to display HTML and CSS in your Android and IOS applications without using TWebBrowser or a wrapper of one of the native web browser controls like UIWebView. One benefit of using this HTML component library would be that you could have controls floating on top of your HTML display elements. Right now the current TWebBrowser has some drawbacks because on IOS and Android it is basically a native control for each OS that is inside of it’s own native View that floats over the real Firemonkey app. You can’t show a working dialog above the TWebBrowser control without doing a workaround. TWebBrowser on Android in Delphi XE5 also has problems with virtual keyboard entry. This HTML Component Library may save that problem because the HTML is being draw right in Firemonkey like any other control. It may also save you some memory in your app by not having to load the full web browser control to display some HTML. The component library is a commercial library and demos are available. It supports HTML 4.01 and CSS3. 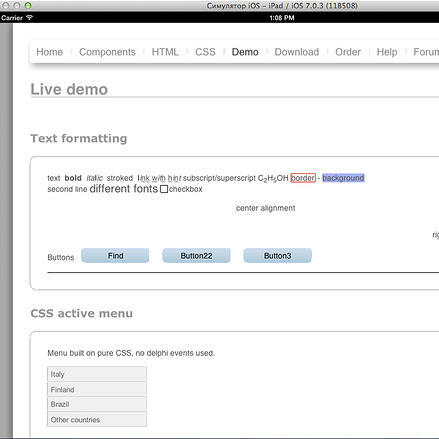 Be sure to take a look at what HTML tags are support and the demos over on their site.